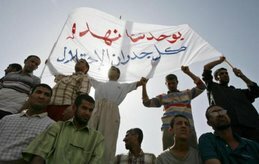 تـضـا مـن TADHAMUN: Iraq: When will it end? 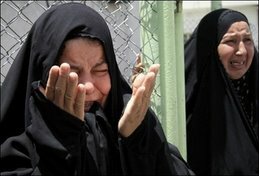 Twelve years on from the 2003 invasion of Iraq, there is no let-up in the misery being inflicted on the Iraqi people. The UN mission to Iraq says violence in the country claimed the lives of at least 1,100 Iraqis in February, including more than 600 civilians. The war crimes of Isis are well-documented: summary executions including of children and people on account of their sexuality; men flogged for using mobile phones; the kidnapping of hundreds of women from the Yazidi sect, who were subjected to physical and sexual abuse, slavery and forced marriage. Thousands of rare manuscripts in Mosul’s library have been destroyed along with priceless antiquities at the museum. ISIS has blown up the historic wall of Nineveh and destroyed the ancient Assyrian site of Nimrud and 2,000 year-old ruins at Hatra. The US also used ancient historic archaeological sites as military bases, such as Ur, capital of the 3,000 old Sumerian civilisation, or Babylon where 300,000 square metres of the site were flattened - including 2,600 year old paving stones, by US tanks. It is worth considering this because what we are told about Isis again and again is that they are uniquely evil. But actually there are recent precedents for many of their crimes from the very forces now ranged against them. It’s reported that ISIS used chlorine gas in an attack on Iraqi soldiers. International law prohibits this. 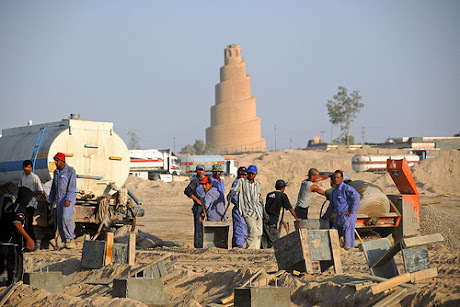 But in Falluja, the US used banned weapons against civilians whose toxic effects are being reflected in birth defects that could continue for generations to come. A recent survey in the city showed a four-fold increase in all cancers and a twelve-fold increase in childhood cancer in under-14 year olds. And like all previous conflict in the last 12 years in Iraq, caught between these opposing forces, it is the civilians who are suffering. The country’s Human Rights Commission reported recently that Iraqis under siege by Isis militants in the town of al-Baghdadi are turning to grass and weeds as means of sustenance. The Iraqi government has earmarked $60 million to Shiite militias. It’s part of the tribalisation of a country that was once a beacon of anti-colonial nationalism against western imperialist interests. In Mosul itself as many as one million people could flee the city if the Iraqi army, backed by US air strikes, seeks to recapture it, aid agencies say. Dozens of homes have had letters left on the doorstep by a shadowy group calling itself the Freemen of Mosul saying "vengeance is coming," and containing threats of retribution. Serious questions are also being raised about the air strikes intended to destroy Isis forces by the US and its allies. There is evidence of scores of non-combatants killed since the US bombardment began in August. In one particular incident, an estimated 65 civilians, mainly women and children, were bombed in a crowded market, an atrocity scarcely reported in western media. Just last week, 22 Iraqi soldiers were killed by US aircraft “friendly fire” on the edge of Ramadi. A lack of strategy, policy, understanding and leadership - but that won’t stop Britain and the US running their bombing raids - as if all Iraq needed was more bombs. Over the next few weeks, millions of ordinary people will be talking politics and all over the country, election hustings are being organised. We should go to these meetings and ask: Twelve years on from the invasion of Iraq, when is it going to end? 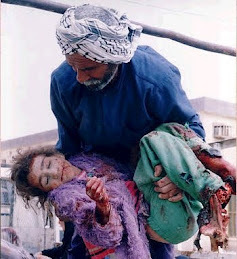 When will you stop the endless war and bombing and western-inflicted misery on the Iraqi people? 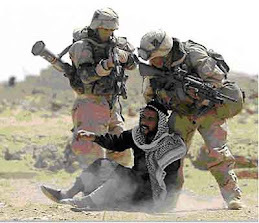 When will the Iraqi people get justice, some reparations for the damage done to their country, prosecutions of the war criminals who inflicted it, control over their own natural resources, an end to foreign interference, and an end to western military intervention?